Want to know the current time in London, or how much is 10 pounds in grams? Google can directly answer some of these common questions without requiring you to sift through pages and pages of links. You would normally need an Excel spreadsheet and may have to learn some formulas to perform basic calculations involving date and time but not with Wolfram Alpha. The tool lets you work with dates using natural English (similar to Outlook Calendar). Wolfram Alpha can instantly answer most of your food and nutrition related questions like how many calories are present in a bottle of Coke? Which is healthier – the french fries served at Burger King or the ones at McDonald’s? You know that a query like “time in <city>” will display the current time of that city. This works for most search engines but Wolfram has an additional feature that works in reverse. You can specify the time of any city and it will convert that time into your local timezone. This should be handy when a client suggests a meeting time using his timezone and you have to quickly figure out if that time works out for you. If you are a fan of Astronomy, you’ll absolutely love Wolfram Alpha and it can compute the position of stars and planets for any given day. The tool can tell you the exact dates for astronomical events like when the next solar eclipse will take place while a specific query like “solar eclipse in new york” will show you the date for the next eclipse that will be visible from New York. Want to know the number of people who are working for a particular company. Wolfram Alpha can get this information and more using simple queries like “market cap of Apple” or “revenue of Google.” You may also use the tool to query past stock prices and indices. What do you get when you pour some red paint in a bucket of yellow paint? What’s the HTML and RGB equivalent of Purple? Wolfram|Alpha is an excellent tool for performing comparisons and it presents results in a neat table making it easy for you to interpret the data. You may compare almost anything and everything from airports, universities, size of popular structures (Statue of Liberty vs Eiffel Tower), quantities (10 lb vs 12 kg), stock quotes, sales tax rates in various cities, sports teams, and even standard paper sizes. Most search engines offer weather forecast for the next 7 or 10 days but with Wolfram Alpha, you can get historic weather conditions of a city as well for any given date. And unlike Google which will only give you sunrise and sunset times for the next day, Wolfram Alpha can compute that information for any past and future date. This is one of my favorites. 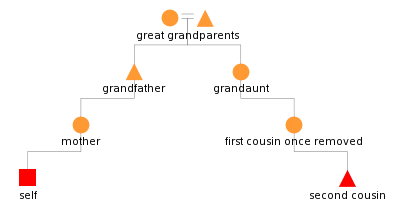 Put it any complex family relationship – like your mother’s sister’s son’s wife’s father – and Wolfram will map it into a genealogical tree making it easier for you make sense of that relation. These are just some uses of the very-awesome Wolfram|Alpha. Do check this page for more examples and then go here to add Wolfram to your browser’s search box.